Figure 1 Superposition (stereo) of the receptor chains mActR-IIec (blue), BR-IAec (red), and TGFPR-IIec (green). The view is looking down onto the central part of the common ligand binding epitopes of BR-IAec and ActR-IIec (the palm of the receptor hand, shaded magenta). The region shaded in red marks marks the position of the highly conserved hydropho-bic residue of type I receptors (Phe85 in BR-IA) that fits into a conserved hydrophobic pocket of the ligand. The ligand binding area of TGFPR-IIec is shaded in green and is clearly distinct from the ligand binding area in BR-IAec. The orientation is such that for BR-IAec the membrane proximal side is at the bottom. The N and C termini are indicated for BR-IAec. Figure 2 (a) Model of the complete pentameric complex for the BMP-2 subfamily with BMP-2 (L, orange), BR-IAec (RI, red), and ActR-IIec (RII, blue). The model is based on the crystal structure of the complex between the ligand and the type I receptors. ActR-IIec was fitted onto the knuckle epitope of BMP-2. The view is approximately along the two-fold symmetry axis, (i.e., onto the plane of the membrane). The receptor chains are not in contact with each other. (b) Model of the pentameric complex for the TGFP subfamily according to Hart etal. , based on the crystal structure of TGFP3 and TGFR-IIec, with the ligand (L) and the type I receptor (RI) colored orange and red, respectively, as in part (a), and the type II receptor (RII) in green. Note that in this model, the two receptor chains are in close contact with each other. The orientation is the same as in part (a). The insert shows a ribbon diagram of the ligand depicting the fingers (f, shown in one monomer only), knuckle (k), and the wrist (w) epitopes. known ligand structures of the superfamily . 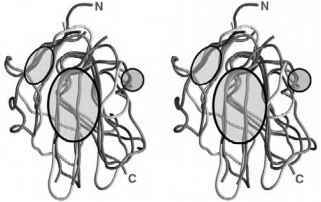 The counterpart to this pocket is a large hydrophobic residue (Phe85 in BR-IAec) that is functionally conserved within the class of type I receptors. 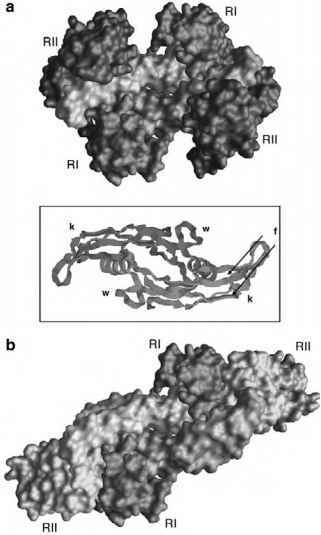 This residue is located in helix a1, a secondary structure element not present in the type II receptors ActR-II and TGFPR-II. 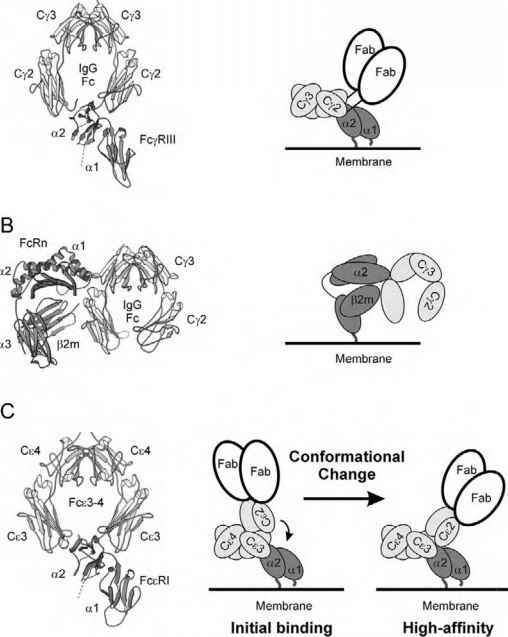 Based on the high degree of conservation of this knob-into-hole motif, it was deduced that this is a key interaction between the ligand and the type I receptors. Two observations may explain why little cooperation is observed between binding of the two receptor types: (1) the knuckle epitope on BMP-2, which so far is defined only by functional analyses and which provides the putative type II receptor binding site (experimentally shown for BR-IIec and ActR-IIec), does not overlap with the binding epitope for type I receptors ; and (2) the structure of BMP-2 in the complex differs only by a slight opening of the finger-helix-cavity from that of the free ligand [12,18]. Alanine scanning mutagenesis of ActR-IIec  identified a cluster of hydrophobic residues that are essential for binding to activin A. This cluster colocalizes with the central part of the palm epitope on BR-IAec (i.e., the part of the molecule that forms the contacts to the ligand), suggesting a mode of binding of this type II receptor to its ligands that is very similar to that described for the BMP-2-BR-IAec complex.